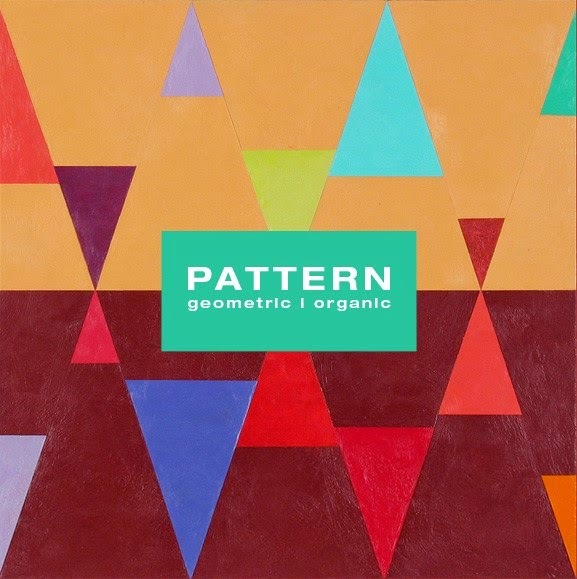 On the heels of my two recent posts on geometric abstraction, which focus on the angular, and a post shortly before that on mandala-like images, I’m bringing those two threads together here. 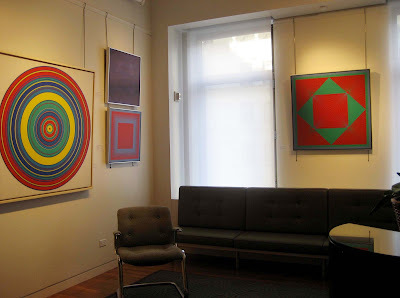 Well, let me clarify: I’m writing about them here, but Deedee Wigmore has brought them together in her gallery in the form of Four Optic Visionaries, an eye-dazzling show of the Sixties and Seventies work of Tadasky (Tadasuke Kuwayama), Richard Anuszkiewicz, Sue Fuller and Mon Levinson. 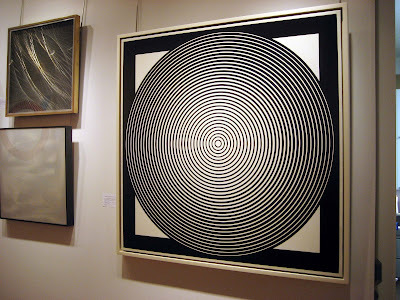 These are some of the original Op artists included in the The Responsive Eye at MoMA in 1965, and an Op revival at the Columbus Museum of Art’s Optic Nerve: Perceptual Art of the 1960s last year. If you’re in New York City between now and November 15, head over to Fifth Avenue near 57th Street to D. Wigmore Fine Art to see the show. 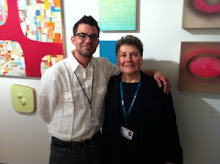 What you will find is a long rectangle of a space, day-lit at one end, with paintings on either side of you. 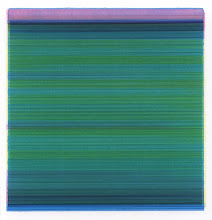 The intensely vibrational nature of these works is such that you almost feel caught up in their hum. Op is by nature visually scintillating—its even comes through in the images posted here. It’s heady and invigorating—Red Bull for the retina. To my mind, or should I say, to my eye, Tadasky and Anuszkiewiz have the most forceful dynamic. 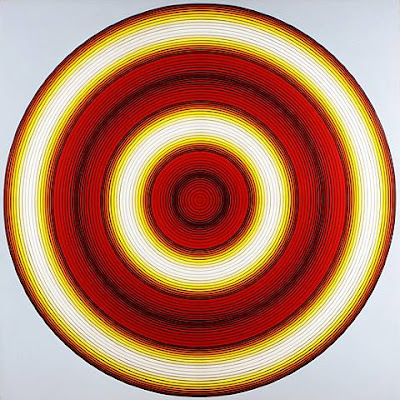 Tadasky’s paintings are round, his imagery concentric. Anuszkiewiz’s are square, their geometry all angles. 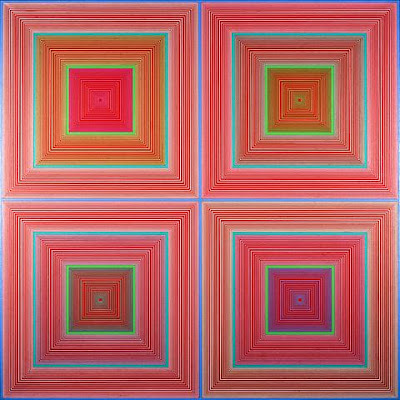 These strong works are closely hung, and sometimes, looking between two paintings, you get caught within an optical illusion. 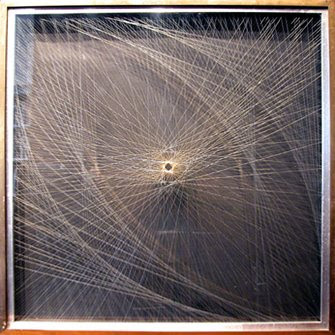 Allow yourself to fall into Tadasky’s concentricity and then look at a square Anuszkiewicz: Straight lines become disorientingly concave. 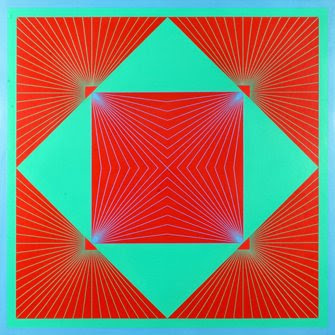 I'm guessing Anuszkiewicz would revel in this optical shift, because his work is calculatedly about challenging and tantalizing the eye with simultaneous contrasts and their dizzying effects. 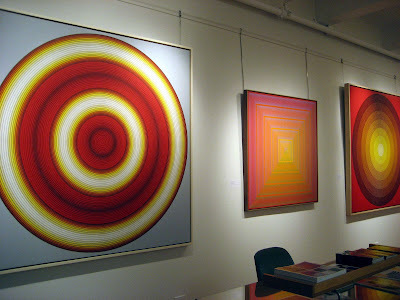 If Tadasky’s paintings reference mandalas, Anuszkiewicz’s have some visual connections to Amish quilts. Quilts are usually geometric—the warp and weft of fabric providing the formalist imperative—and Amish expression is surprisingly bold. 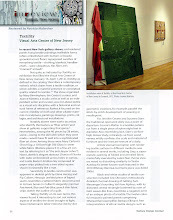 In terms of actual textiles, however, Sue Fuller’s constructivist work involves layers of thread. 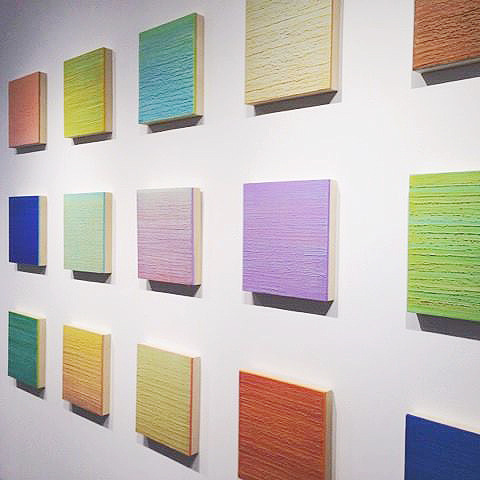 It’s woven sculpture, or sculptural drawing—call it what you will. Fuller’s is a vision from a particular time, and I'm not as enamored of it as I am of the aforementioned work, but here’s what impresses me: Back in the Sixties when this work was made, plastics were a relatively new material for artmaking. Fuller planned well, worked smartly with engineers and scientists, and came up with materials that have held their own over time. Today her color remains rich and her lines taut. 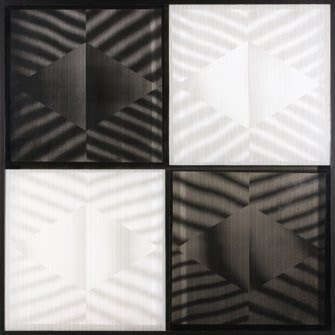 The optical dimensionality of Duncan's installation also relates to the fourth artist in the Wigmore show: Mon Levinson, who works achromatically in black, white and gray. 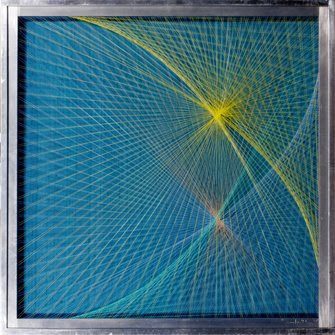 His constructions in the show are painted and printed on multiple layers of plexiglass, so that the optical effects are not just seemingly dimension but actually so. I'll end the post here, with the metaphor of depth and dimension not only dazzling the eye but moving it in and out out of planar space--and stretching back and forth through time. 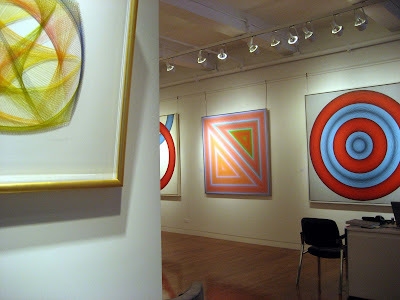 that d. wigmore show looks awesome.. wish i had known about it when i was in nyc last week. Dialogue: here, you paint these pieces of paper. Dialogue: yes, this reminds of something Donald Judd once said. 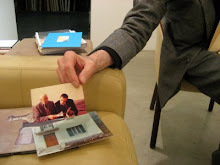 Dialogue: you know about Donald Judd? we'll leave this factory and I will take you to lunch. 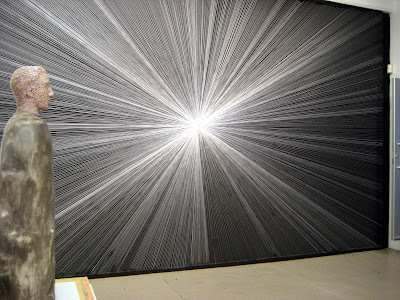 And also, I am amazed by Anuszkiewicz's work, ("Celestial" in particular...). Thank you for posting these! Your fans in the styx most appreciate it! I saw the ad for this show in one of the art mags, maybe Art News. 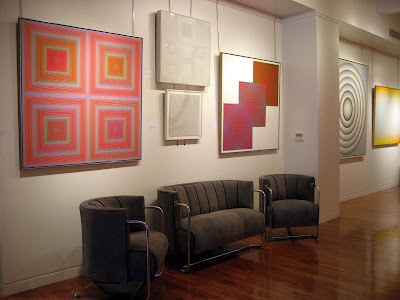 Since I had recently posted work by Tadasky in "Centering" in connection with his show at Sideshow in Brooklyn, I went to look. Then the Anuszkiewiczs blew me away. I didn't write too much about this in my report, but the whole experience was kind of trippy. 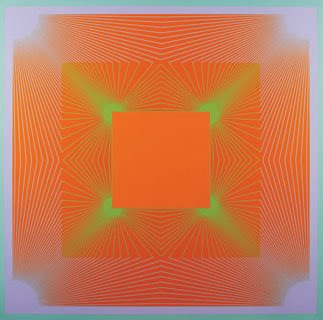 The closeness of each painting means that the vibrational field of one overlapped with the vibrational field of another--visually speaking--and standing within the overlap and looking alternatingly at the paintings gives you a whole different view of the work. One of the things about the art world's current new-new-new consumer mentality, and the incessant focus on 25-year-old MFA grads, is that relatively contemporary art history gets pushed back. 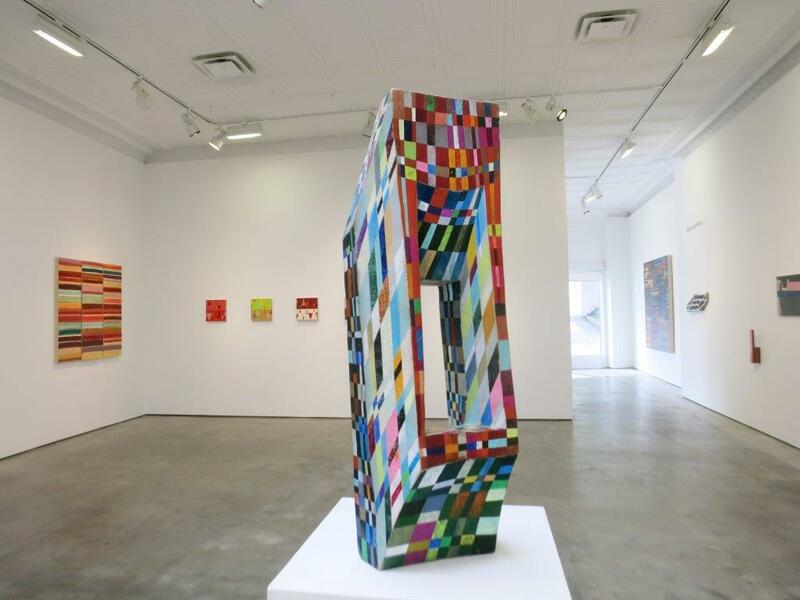 A show like this is historic chronologically but contemporary in terms of renewed interest in geometry and color. 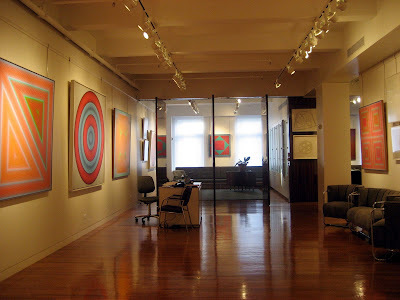 Turns out, too, that the gallery shows the estates and the work of living artists who are historically important in geometric abstraction. Love all the Palin/McCain stuff on your side bar. There are some really funny things...but ultimately, the situation is just scary! Thanks, 13moons. Yes, it's horrible and scary. But humor helps us deal with it--well, it helps me deal with it. Ultimately it's not just enough to get out and vote. We have to get out and vote for Obama, and between now and November 4th, to work to persuade others to vote for him, too. I hope this humor, while appealing to the already converted, will help to noodge a few others into voting for Obama. I've got a great empathy for the works shown but from looking at the images shown I can't help making the observation that the way of hanging the works is not very respectful. 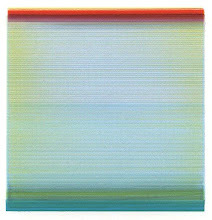 Two bars descending; very little space between one work and another so that at looking at one painting one must have picked side-flickers from the adjacent. Let the works breathe. I wouldn't presume to speak for the gallery, but my guess is that the rent on a midtown space--Fifth Avenue midtown at the corner of 57th Street--is in the high five figures a month. I'm guessing that for many galleries there, a spare installation is not an option. As for the hanging devices, they're not my favorite either, but in the presence of these works, they become invisible after a while. Dear Joanne, Thanks for the kindness in responding to my post. Perhaps my observations were too severe but I still can't help thinking that when painters take so much trouble to achieve a point of balance the descending verticals of the hanging system can radically undermine the perception of the image. The 'space between' element is, as you point out, no doubt more a question of economics rather than aesthetics.